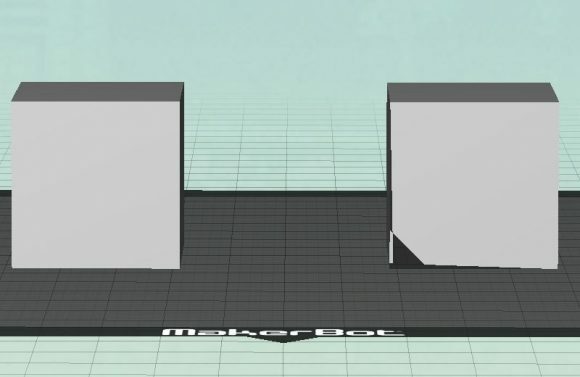 Two of the most common issues with 3D models that are giving you problems to print, no matter if you designed them or somebody else did, are the presence of Non-Manifold Edges and Flipped Triangles. There are of course some more issues that may be present as well, but I’ll be talking about these two as they are the most common cause that may result in you 3D print looking not as it was supposed to be. Non-Manifold Edges are parts of the model that have holes in them or unwanted faces, often this is referred to as the 3D model not being water tight as if you pour water in something with holes it will just get out. Flipped Triangles are parts of the object geometry that is facing the wrong way, it is normal for connected triangles to be facing the same direction, however often when you design a 3D object you may end up with triangles that are facing different directions. As a means of demonstration I’ll be using two cubes drawn with SketchUp (go back to Part 4 of the series to learn more about that software) and in these two I have intentionally created issues, so that you can easily see the problem and how it may affect your 3D print. The cube on the left is with a flipped triangle on the side and a surface on the top and the cube on the right is not watertight (has some holes on one of the sides). 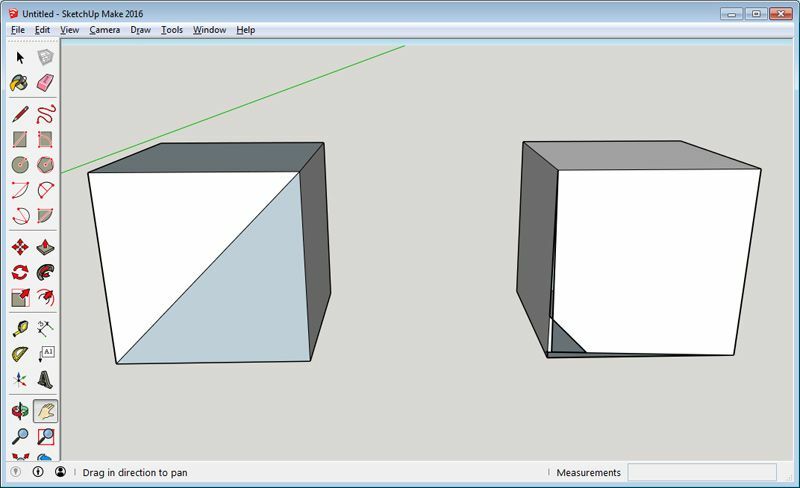 Notice how SketchUp uses different colors for the two triangles on the side, this is a hint for the user that there might be something wrong as they seem to be pointing at different directions. The large holes, intentionally left big, are clearly visible as well, though imagine if you have many of these and they are very small or the flipped triangles are small and you need to zoom in a lot to notice the color difference. Depending on the 3D printing software you use the standard 3D model preview might or might not show any problems, often flipped triangles are not being shown in the default preview and as I said holes in the models might be too small to notice. When you generate the Print Preview however and the software actually slices the 3D model to a layer by layer structure you can see weird things happening to your models such as strange deformations or missing parts. This happens as while the slicer is working the problematic geometry actually confuses the software and it just gives weird results. Of course depending on the object and the issue sometimes even with a non-water tight model you can still get a good print without problems. When you see that something is wrong the best thing to do is go back to the 3D modeling software and try to find the problem in your 3D model, then fix it and open it again in the 3D printer software. In case you noticed a flipped triangle somewhere it is very easy to fix it in SketchUp for example, just select the problematic face, right click with the mouse and choose Reverse Faces. If you found a hole somewhere you can just add some extra geometry to fill it in and make the 3D model solid again. Of course at times finding these issues can be a problem, especially if you have problems that are not easily visible from the outside of the 3D model. Some 3D printer software like the Simplify3D slicer I talked about in the previous part of the series has additional tools for detecting problematic geometry in the 3D model that may be helpful in figuring out what is wrong. It even has some automated tools to help you try and fix the problem without having to edit the actual 3D model, though these may not work very well or as intended some of the time. There are also alternatives available for different software and even online services that offer to fix common issues in 3D models without you having to actually edit the 3D model. Since there are quite a few options for automatic fixing of problems with 3D models that need to be repaired in order to be 3D printable I will not be covering them all. 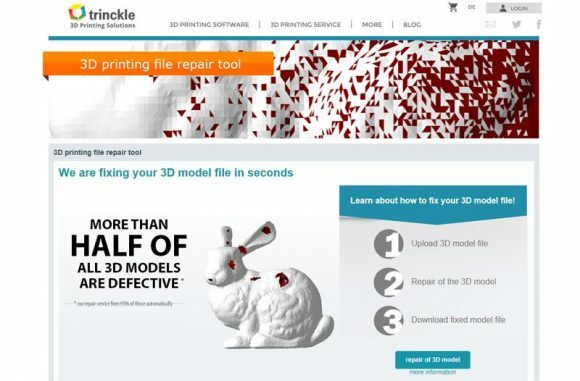 However I want to point your attention to a free online service for 3D model repair that in my experience has been giving some of the best results in successful repair of various issues after quite a lot of testing of different tools and methods. The service is being ran by a company called Trinckle that apart from offering to freely repair your models also provides 3D printing services, though you can just download the fixed model and print it yourself. So you might want to give it a try before going into manual fixing mode trying to figure out where the problems in the 3D model might be and how to fix them yourself, especially if you are new to the whole 3D printing and 3D modeling thing. One of the “problems” of the consumer 3D printers is the fact that when you get a 3D print ready you can usually see the lines that build up the object (these are the printing layers), though that is not actually a problem, but just the way these devices work. The higher the resolution you print with, the thinner the layers are and the visual quality is better, but that is achieved with more time needed for the printing. 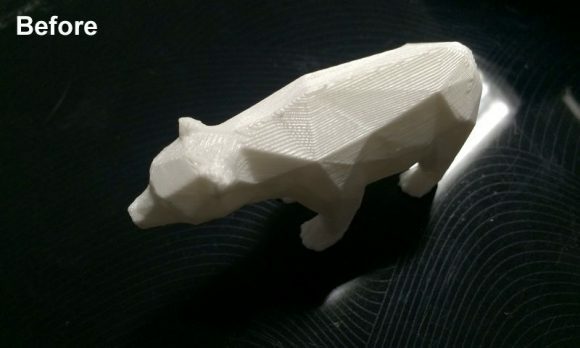 There are ways however that you can improve further the final quality of a 3D print with some additional post-processing work after it is made by the 3D printer. This is achieved by using sanding paper to take away some of the outer surface of the model and/or by using paint to fill in some of the gaps between the layers and make them less distinguishable. The sanding process does require some effort and time and is not always applicable as some objects have way to complex form and many small details, making it very hard to sand by hand (a rotary tool with a fine tip could also be used at low RPM). Furthermore the sanding process requires you to use sandpaper with different grit size, starting from a rougher lower number and going in a few steps to a much finer higher number. This way you essentially start by taking more material from the object smoothing the differences between layers and then moving to a finer grit to actually smooth out and polish the surface. You may need a little practice for this to get the hang of things, but the final results could be well worth it. 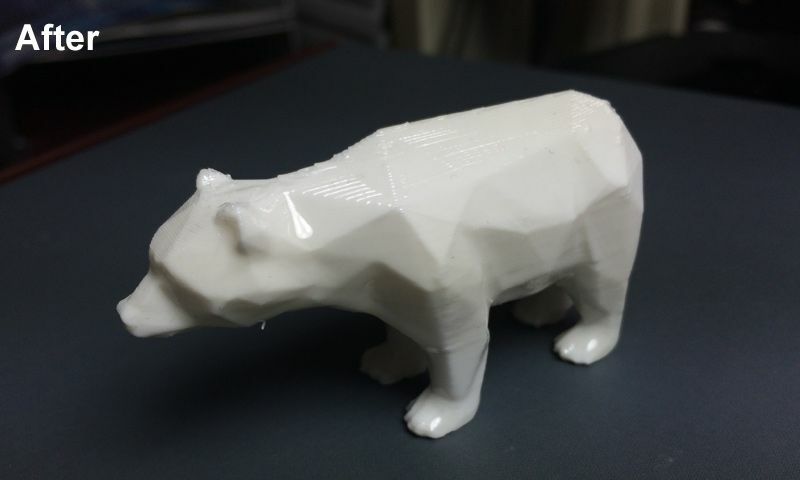 The alternative option is to use paint to cover a sanded on non-sanded 3D printed object, it is a good idea to use paint that can provide thicker layers such as spray cans of paint for objects that are not going to be sanded as it covers better and gives better results. If you have sanded the object you may as well go with a thinner paint cover such as the one achieved with an airbrush for example as you already have a pretty smooth surface. Furthermore, depending on the paint used you can get either a matte or glossy look, this can be further strengthened if you decide to apply some clear coating on top of the paint. You can get creative here and the results can be quite nice with some paint. Using paint also gives you the option to overcome some of the limitations in terms of colors that the filament you use has. You can of course use some acrylic paint to hand paint a figure that you have 3 printed for example, that way you will get a better looking “full color”-like print from a 3D printer that can work with single color filaments only. 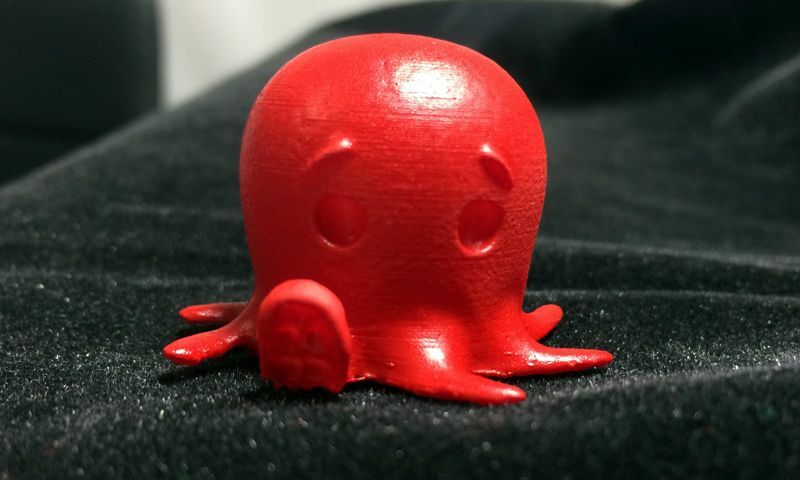 The commonly used 3D printer filaments such as ABS and PLA have a hidden weakness, they can very easily be dissolved by some strong chemicals, but you can use that fact to your advantage. Some people are using the vapors of strong chemicals such as Acetone and THF to actually smooth the outer surface of 3D prints as these are essentially melting the outer perimeter of the layers and are giving them nicer and smoother look and feel. A word of serious warning here, these chemicals can be dangerous to your health and should you decide to use them you should be very careful not to get them on a bare part of your body or to inhale any of the fumes from them. Because of the possible danger to your health these methods are not that popular as for example using sandpaper or painting your 3D printed object. Anyway, if you want to try, then you should go for Acetone for ABS plastic as it melts it and creates a smoother and glossy looking surface. As alternative to Acetone you might try smoothing ABS 3D printed objects with the use of Methyl ethyl ketone (MEK) with good results. Have in mind that Acetone and MEK are not suitable for PLA 3D prints like with ABS ones, so do not try them for smoothing PLA 3D prints. For PLA plastic smoothing you need to go for Tetrahydrofuran (THF) instead. Another dangerous solvent that needs to be extra carefully handled and also very flammable like the other two chemicals also mentioned already! Another, much more safer alternative that could be used for smoothing of all kinds of 3D printed objects is the Smooth-On XTC-3D coating. Protective coating for smoothing and finishing 3D printed parts that does not melt plastic. XTC 3D fills in 3D print striations and creates a smooth, high gloss finish. The need to post finish is almost eliminated. XTC 3D can be applied to both SLA and SLS prints. It works with PLA, ABS, Laywoo, Powder Printed Parts and other rigid media such as EPS, EPDM and urethane foam as well as wood, plaster, fabric, cardboard and paper. I have tried this solution where you mix two components and then apply a thin coat of the material over the 3D printed object, then wait for it to cure and you get pretty good results. So it works pretty good, though you may need some getting used to working with the coating in order to be able to achieve consistently satisfying smoothing of different objects. In the end you have multiple different variants for additionally improving the look and feel of your 3D printed parts, it is up to you to choose what works for you should you even need to do this extra work at all.